Innovate UK has awarded an energy storage firm £1.5 million for a new hybrid version of its existing systems. Highview Power Storage, which develops storage solutions for utilities and distributed power systems, has been asked to modify its Liquid Air Energy Storage (LAES) product. The technology uses off-grid or surplus energy to compress and liquefy air, which can later be released at a high pressure, turning a turbine and generating power. Unlike pumped hydro or Compressed Air Energy Storage (CAES), LAES does not require specific geography and can be located at the point of demand. By incorporating supercapacitors and flywheels it is hoped the system will be able to respond to grid frequency events within one second and meet the requirements of National Grid’s new Enhanced Frequency Response (EFR) service. 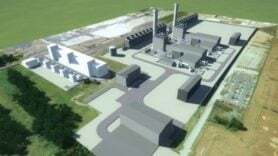 The hybrid LAES system will be added to the company’s 5MW Pre-Commercial Demonstration plant at a landfill gas site in Greater Manchester. The aim of the project, which aims to be operational by summer next year, is to test the performance and economics of the facility. Business and Energy Secretary Greg Clark recently launched the first phase of a £246 million investment into battery technology today.